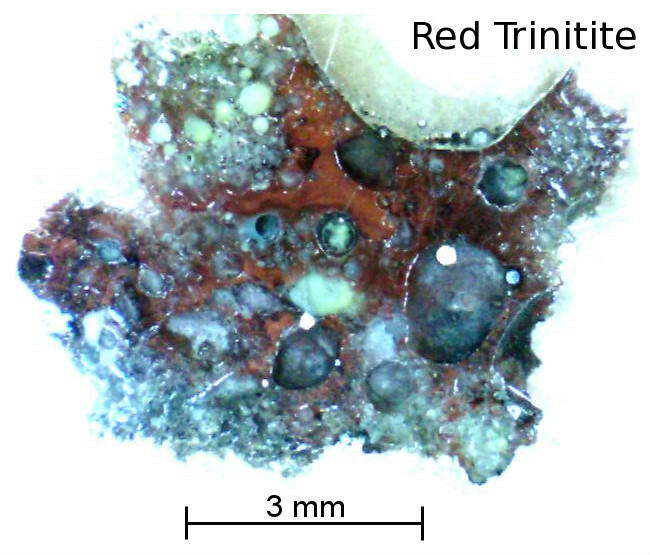 Red trinitite is found to the north of ground zero of the Trinity test. The red colour is due to the presence of copper in the glass. Close examination with the optical microscrope and scanning electron microscope reveals that this glass contains a number of metallic chondrules. These metallic chondrules are melted bits of the first atomic bomb and the surrounding support structures — history encased in glass. From Trinitite - the atomic rock by Nelson Eby et al.